The following list below is a partial list of the large body of supportive evidence documenting the use and efficacy of Mandibular Tracking in the Diagnosis and Treatment of TMD/ MSD. Progress in the field of mandibular tracking was limited by the capability of available instrumentation. As early as 1931 Hildebrand used cinematography of a moving reflective point to track mandibular movement (Hildebrand, G.Y. 1931). Cineflourography was used by Klatsky in 1941 (Klatsky, 1941) and was followed by Kurth’s use of stroboscopic photography in 1942 (Kurth, 1942). Mechanical tracking has also been used by several investigators throughout the history of mandibular tracking in dentistry (Boswell, 1951). The interference of mechanical tracking devices with normal mandibular function was a common problem. The first use of electronic recording techniques to record occurrence and duration of occlusal contacts during mastication was reported in 1953 (5). Brewer and Hudson later used miniaturized make or break switches to study tooth contact (Brewer et. al., 1961). Adams and Cannon developed instrumentation to trace actual movement patterns of the mandible during functional and parafunctional movements (Adams et. al, 1964, Cannon et. al., 1964). The relationship of the mandible to the maxilla must be determined in three dimensions. 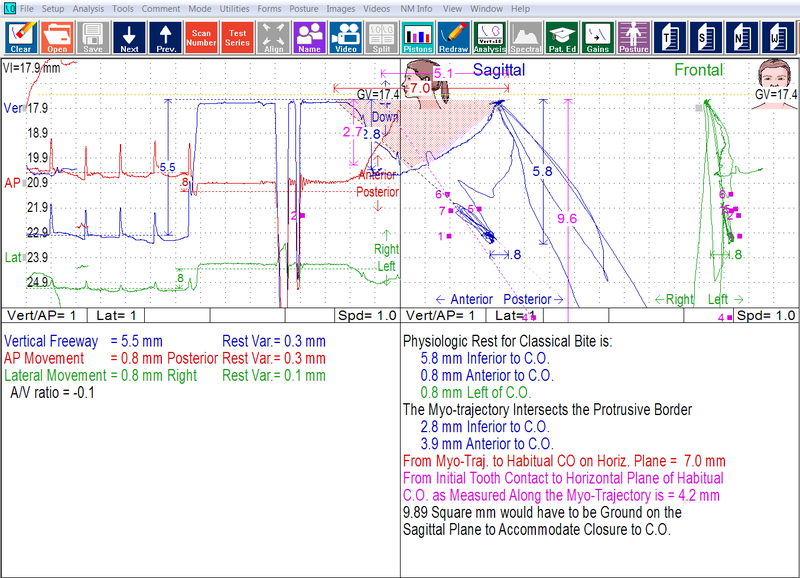 Data output must be continuous to permit analysis of the dynamic components of mandibular function. The system cannot encroach on the occlusal plane so as to interfere or alter proprioception. To avoid unnatural proprioceptive input and minimize mechanical limitations on mandibular movement, no supporting structures or wires should protrude from the mouth. The practical use of the system requires that setup time be minimal and htat the system be self contained. Measurement in the vicinity of the occlusal plane should be accurate to within .1 mm. The system should be widely available and operable by dental personnel (Jankelson et. al., 1975). Belser and Hannam demonstrated that an early model Myo-tronics Kinesiograph was capable of recording incisal point movement to within .3 mm anywhere within the envelope of chewing (Belser et. al., 1985). The same authors have used this instrumentation in other scientific studies, demonstrating their confidence in the capability and accuracy of this modality (Belser et. al., 1986). Today’s Mandibular Kinesiograph is a computerized electronic measuring device that can track mandibular movement with .1 mm plus or minus accuracy in three simultaneous planes as well as precisely measuring opening and closing velocity. The value of this measurement capability to the clinical dentist responsible for establishing a predicatable and accurate occlusal position diagnostically and therapeutically is self evident. The ability to record, measure and capture and desired occlusal position transcends occlusal philosophy.